T.M. Rao (Turaga Madhusudhana Rao) was born on 3rd July at Guntur in Andhra Pradesh. He studied in Guntur upto Intermediate in the Andhra Christian College, and later joined the Andhra University at Waltair for his B.Sc (hons) and M.Sc (Research).He joined the Geological Survey of India as a Gazetted officer in 1948 and retired as Director in 1985. Although he had keen interest in astrology, he could not pursue this and could do so only after retirement in 1985. He started his professional consultations in 1987 in the Twin Chities of Hyderabad and Secunderabad. He developed interest in Medical Astrology and used to give opinions since 1997 to the different corporate hospitals of Hyderabad in regard to various problems quite successfully. The Open International University for Complimentary Medicines, Colombo, has conferred upon him D.Sc., He got several titles from different astrological associations and bodies as well. He authored the book entitled ‘Marriage-Matching Astrologically’ and Astrology for Layman’ published by the Pustak Mahal, New Delhi in September 1999 and November 2001 which have received wide publicity and clientele from different States of India. A very important place is assigned in Hindu Astorlogy to the part played by the Moon in the fixing up propitious times. The moon rules the mind and all our psycological inhibitions and his position in the muhurtha chart is to be particularly dignified. Whenever a Muhurta is to be made it should always been a sympathetic connection with the birth chart. There have been many books on astrology but most of them, deal with predictive astrology proper. 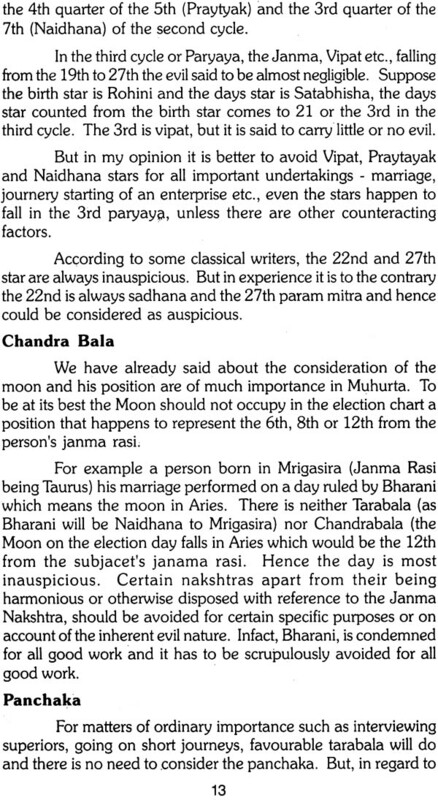 Muhurta, whilst no doubt an important adjunct to horoscopy, has got its own distinctive place in the general scheme of astrological literature. This book tries to show that astrology engages human effort by asking a man to do the right thing at the right moment. 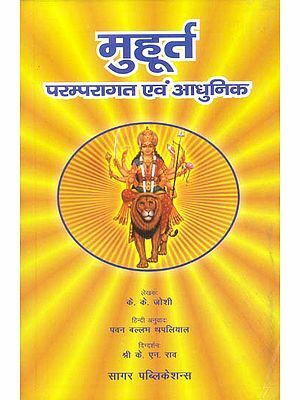 The aim of this book is to present to the reader in a consise form all the essential principles of Muhurta, so that one can make use of this in all walks of life. A vast literature exists in Sanskrit on the subject. I have tried to post in these pages the essential principles culled our from Standard works. The reader is at liberty to reject my opinions if he feels they do not appeal to his acceptance. The aim of the astrology is to dispel the fear of the unknown to scope for the free play of effort and Muhurta just supplies the want. The subject is vast, yet I have gathered the informations from many acknowledged sources, which I am sure will be found to be of the greatest use to the Modern Man so that instead of merely passing through the formality of astrological consultation, by entrusting the election of a muhurta to quacks montebanks, he may be enabled to time his activities as to move in harmony with the laws of Nature. Parents waste huge sums on marriage shows such as dinner, music, jewels and pandals but they are niggardly in paying proper remuneration to a deserving astrologer who could fix up a really auspicious moment. If astrological consultation is not to be a matter of formality but of serious importance then the learned astrologer should be paid properly. A proper Muhurta will ensure the future of the couple and anything expended towards this item is well spent. If without caring to consult an expert astrologer the marriage is done and it proves a failure, then all the energy and finance spent would be a sheer waste. Hence it is very necessary that an expert astrologer is pressed in to service. Muhurta bearing on Public matters are of dubious value in view of current prejudicial official attitude entertained towards astrology. Yet in actual practice, astrologers are being consulted in private for official purposes, the rules bearing on elections pertaining to public affairs are bound to be of some value. It is hoped that the day is not far off when astrology is given its due by the State and recognised as the science of par excellence for the solution of national and international problems. 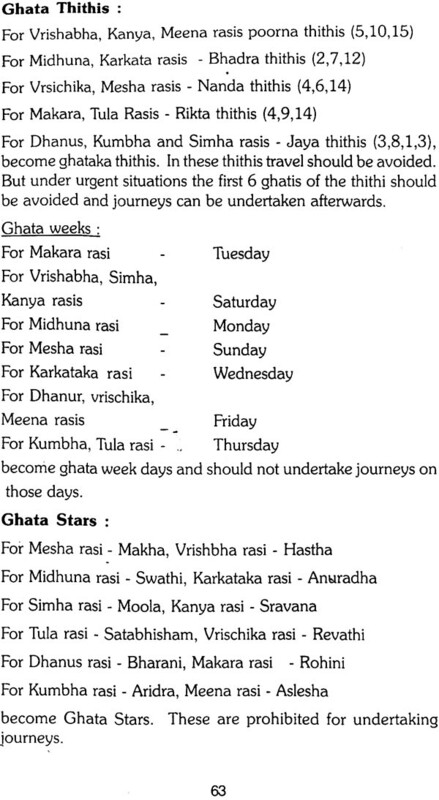 Muhurtha is that part of the time of 48 minutes (2 ghatis) when an auspicious function is performed. 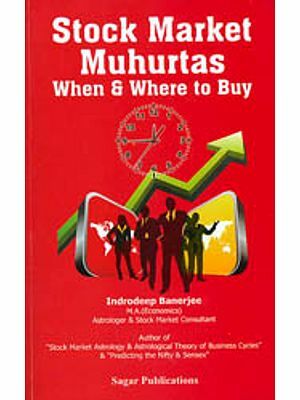 Muhurta is supposed to nullify the evil inspite of the chart having certain blemishes. Hence, it is said that a Good Muhurta will nullify the bad effects to a great extent. One should always remember that in electing a suitable muhurtha one should try to avoid the major aristas (doshas) by fortyfying ascendant i.e. lagna and taking advantage of the exceptions and ignoring the minor ones. Thus it will be seen that the most important question in muhurta is the fortification of the Lagna and its lord. What is meant by Muhurta? How far is it superior to horoscopy? Horoscope reveals what is indicated by the planetary positions at the time of birth being the resultant of ones own previous karma. Muhurta on the other hand is much more important. It gives valuable directions by following which the person will be enabled to remove, neutralise, counteract or overcome the evils indicated by the horoscopic chart. Horoscope is diagnostic. It merely points out the ills but preaches no remedies. Muhurta is prescription as well as preventive. It tells how by undertaking venture at auspicious times, one can ward off the evils and ensure success. Suppose weak in education is indicated by the position of evil planets in the fourth house from lagna and by the affliction of jupiter, lord of education and mercury lord of intelligence, these planetary conjuctions indicate weakness of education in a man as a result of his karma in previous states of existence. Muhurta says that the obstruction to educational progress by the planetary conjunctions indicated at the time of birth can be minimised by fixing an auspicious time of commencing the education i.e. Aksharabhaysam. Suppose evil planets in the 5th house indicates loss of children, the muhurta comes to his help by first by asking to marry at a certain auspicious time to minimise or modify the afflictions to the extent that the birth and survival of at least some children may be ensured. 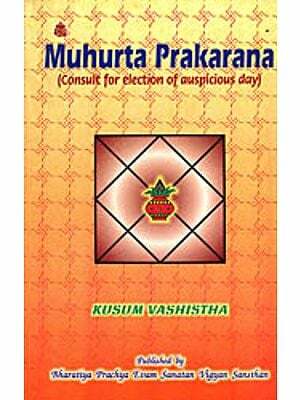 Thus muhurta helps one to minimise or modify the evils of our past karma to a considerable extent. It should not be construed that Muhurta is the master key to all wealth and happiness. Muhurta tells us to do certain thing if failure is to be avoided. Thithi: This is the time during which difference of the inclement of longitude of the sun and the moon on to 12. The lunar day is to the Hindus of the most prominent practical importance, since by it one regulate the performance by religious ceremonies one upon it dependant the chief consideration of Muhurta. In other words the thithi represents the lunar energy and the lunar energy is identified with the natural energy. Therefore a minute knowledge of the lunar movements constituting planets is said to give us wealth. Each thithi is equal to 0.9483 of a day so that the lunar months is equal to about 29.53 days. The ending time of the thithi is the moment at which the moon is removed from the sun by multiples of 12°. Thus when the moon is 12° away from the sun, the first lunar day or prathama ends. When 24° Dwitiya and so on, when in conjunction the Amavasya (New Moon) and when opposite (180°) Poornima (Full Moon) ends. So it is enough what thithi rules at the time of birth. To find the lunar day or thithi deduct the longitude of the sunfrom that of the moon. If the difference is less than 180° it is the bright half or Sukla Paksha, if it is more than 180°, it is the dark half or Krishna Paksha. Vara: This is the ordinary week day. The week days are named in accordance with the certain astronomical consideration. Therefore a week day being the name of the name of the particular planet, the influence of the planet is said to be prominent. The week days are numbered as follows : Sundy - 1, Monday - 2, Tuesday - 3, Wednesday - 4, Thursday - 5, Friday - 6, Saturday - 7. Nakshtra: The zodiac is marked by 27 nakshtras often termed as lunar mansions. 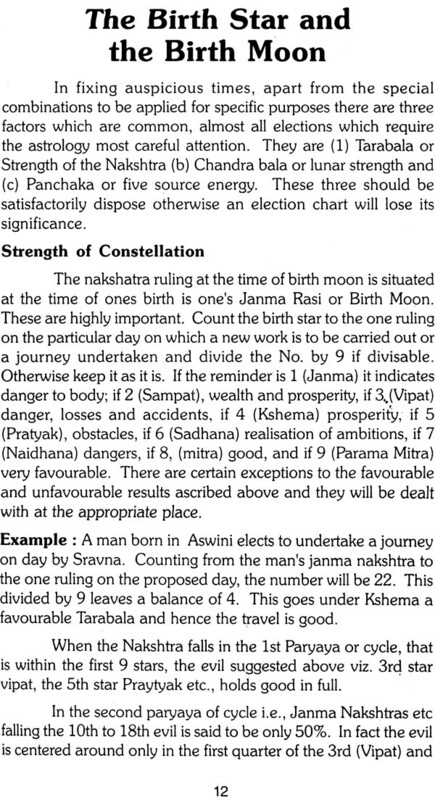 Therefore the position of a Nakshtra is dependant upon the actual time taken by the moon to traversse 13°20 of ediptical arc, of course, always beginning the first point of constellation of the zodiac. 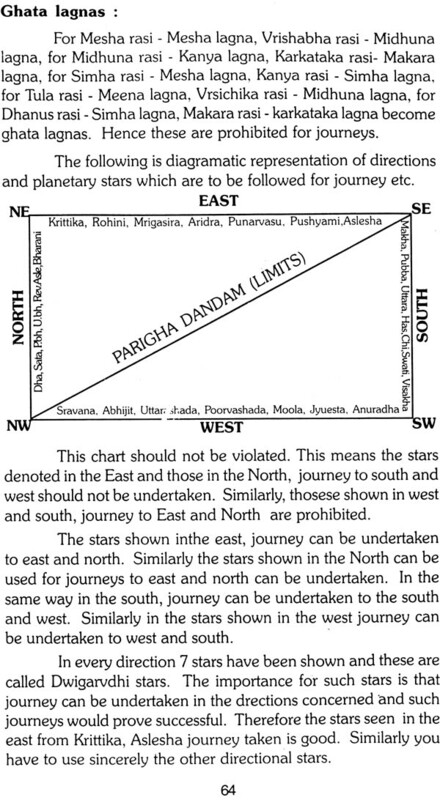 The Janma tara (birth constellation) or Dina tara (the constellation of the day concerned) are obtained thus. Yoga: It is the period during which the joint motion in longitude of the sun and the moon attain 13°20. Every Hindu almanac contains a column specifying the yoga for each day and when it would end. There are twenty seven yogas (sea table). Yoga is supposed to strengthen our bodies and help us to ensure health and life in its various phases. Karna: And finally we have Kama, or half lunar day meaning thereby the time taken to complete the distance which should be the multiple of 6 between the Sun and the Moon. There are 11 karnas, viz: 1) Bava, 2) Balava 3) Kaulava, 4) Taitula, 5) Garija, 6) Vanija, 7) Visti, 8) Sakuna, 9) Chatuspada, 10) Naga, 11) Kimstughna. The first seven come by rotation eight times in a lunar month, commencing with the second half of the first lunar day. The last four are said to be permanent Karnas and occur in order with the second half of the 29th lunar day. In Muhurta, it is always advisable to strengthen the ascendant and its lord and the moon. Each type of muhurta requires fortification of some appropriate house and planet and these will be discussed in their proper places. Even when the lagna is strong, certain parts of which go under the name Lagna Tyajya should be rejected. Sometimes only fixed signs are to be chosen, sometimes movable signs are to be chosen. Hence the reader has to very carefully understand these subtle distinctions. In Aries, Taurus, Saggittarius and Virgo the first 3° should be avoided as it is supposed to be in the nature of a serpent and Scorpio the last 3° has to be avoided as it is supposed to be presided by evil force of Rahu. The middle half ghati (13°30'to 16°30) should be rejected with regard to Gemini, Libra, Leo and Aquarius as it is ruled by an evil force termed Griddha. Tuesdays and Saturdays should be avoided for all good and auspicious works. The 4th, 8th, 12th and 14th lunar days both in the bright and the dark halves are unsuitable for holding any auspicious work.